For those who missed Cai Guo-Qiang: Fireflies in Philadelphia or hoped for another ride, good news: the whimsical interactive artwork by internationally renowned artist Cai Guo-Qiang will be featured at Baltimore Office of Promotion and the Art’s Light City festival from April 14-21, 2018, and is being presented as part of the festival’s BGE Light Art Walk. Originally commissioned by the Association for Public Art (aPA) with Fung Collaboratives, Fireflies premiered in fall 2017 along Philadelphia’s Benjamin Franklin Parkway on the occasion of the Parkway’s centennial, with major funding from The Pew Center for Arts and Heritage. Cai Guo-Qiang: Fireflies in Philadelphia. Photo Jeff Fusco Photography © 2017. 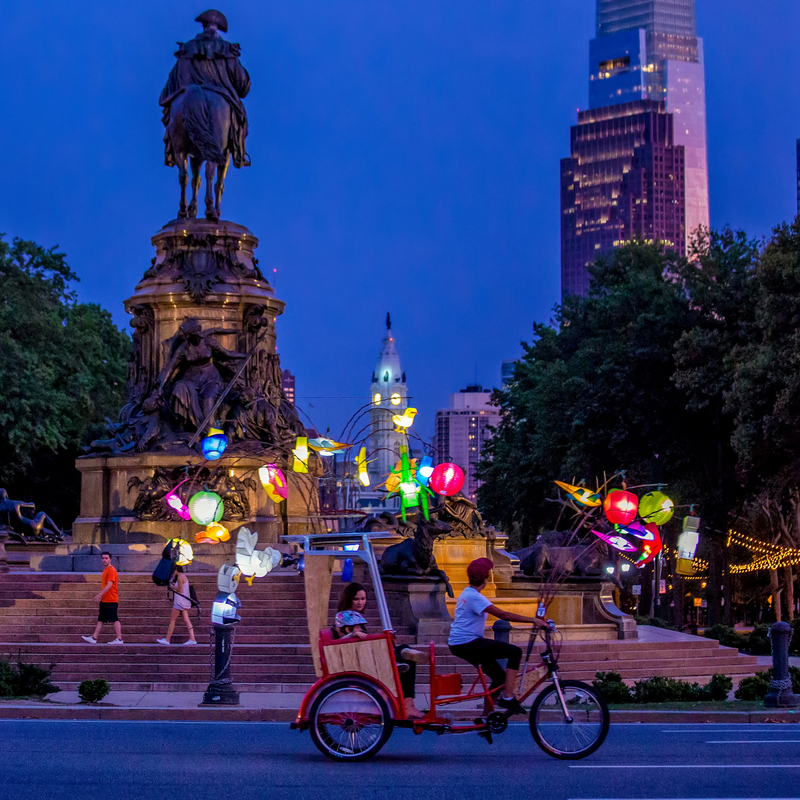 As in Philadelphia, Baltimore’s festival goers will be able to take free rides in one of the 27 Fireflies pedicabs, which are adorned with clusters of hundreds of illuminated, handmade Chinese lanterns. The pedicabs will glide along Baltimore’s harbor and can be used as transportation at the festival. Light City is a free festival of light, music and innovation that reimagines Baltimore’s waterfront into a premier cultural destination. Fireflies will be one of 21 light installations at the festival’s BGE Light Art Walk along the Inner Harbor’s brick-lined promenade, which features art installations, performances, concerts and more, including an Opening Night Parade and a Closing Night fireworks finale. The internationally renowned artist Cai Guo-Qiang draws on memories of the traditional lantern festivals of his childhood for his latest site-specific project.